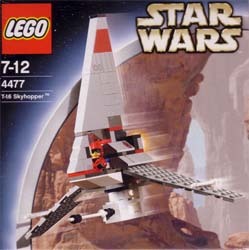 The T-16 Skyhopper seems like a strange choice for Lego to choose to release. It only featured in the first Star Wars movie for a few seconds (although I'm sure Star Wars fans will e-mail me to let me know differently). But, this little model is quite cool. Not only can you build the T-16, but there are instructions to build two other space craft - both of which look extremely cool. So it won't be a case of building the T-16 and then getting bored, you'll have hours of fun building all three models, and then designing one of your own. The models are not that difficult to build and come equipped with a pilot. For Lego fanatics, and Star Wars nuts that want something different, this is ideal. It seems a little over priced for what you get, but then a lot of thought has gone into the design of this model and it will amuse kids for hours.